Millennia Sport is a classic – simple in appearance, but highly sophisticated in design. 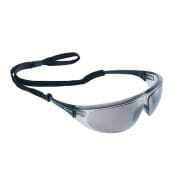 This is sporty, sleek and stylish protective eyewear with exceptional optical properties and a universal fit. Millennia Sport is a classic – simple in appearance, but highly sophisticated in design. This is sporty, sleek and stylish protective eyewear with exceptional optical properties and a universal fit. The lightweight value-based frame gives superior side and brow protection. The Millennia Sport comes standard with a flexicord retainer. The lightweight value-based frame gives superior side and brow protection. The Millennia Sport comes standard with a flexicord retainer.